This review is by Julie Bunting, and was published originally in The Peak Advertiser, the Peak District's local free newspaper, on 23rd July 2001, and is reproduced with Julie's kind permission. 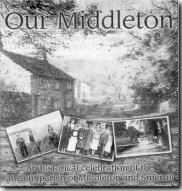 This beautiful book, published by Middleton Village History Group, is described as an historical celebration of the ancient parish of Middleton and Smerrill. Full of history certainly, but it is also vibrant with living memories and hand-me-down tales of life in this tiny corner of the Peak. Many people have contributed to Our Middleton, one of several local projects chosen to mark the new millennium. Difficult choices had to be made by the authors and editor since there was far more to tell than they could afford to publish. Yet as a result, the material has been distilled into a rich brew and a valuable work of record. Chapter headings range from Stone and Minerals (with a spooky story from Middleton Mine) to Life on the Land - touching on bygone outbreaks of foot-and-mouth and cattle plague, and Middleton at War. Random surprises reveal that 'Middleton Moss Green' tiles were once produced here and that the area has a close connection with the davieblock, often seen advertised but for many of us an object of mystery. And should anyone ever need instructions on how to build a mere in the traditional manner, here they are. Photographs of farmers at work and leisure contribute to a particularly delightful and rare selection of illustrations throughout the book. School photographs furnish names deeply rooted in the parish, and genealogists will also appreciate a list of associated surnames. On the story-telling scene there are squires, millers and miners, a lay preacher who was 'full of the Holy Ghost and power', a murder, a kidnapped bride, and a Victorian romance with a heart-melting photograph of the swain in contented old age. With 128 pages, numerous illustrations, many in colour and a full-colour hardback cover, Our Middleton well deserves to be a sell-out and all profits will benefit the village.